The "A1" class is a specialized tactical branch of the most tested and trusted military and personal defense weapon in history: the 92FS. We started with the super-reliable 92, keeping the engineering characteristics that make it so accurate, safe and dependable; then, we added some features prized by today’s most demanding tactical shooters as well as by those wanting the absolute best for home defense or personal protection. The result is the 92A1, a pistol that is as reliable for its intended use as it is safe and user-friendly even for the novice. 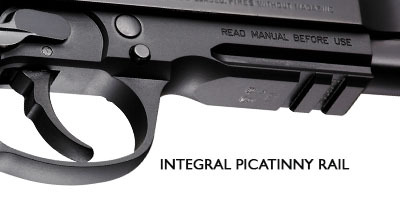 The most noticeable difference between the classic 92FS and the 92A1 is that this comes with an integral Picatinny rail situated in front of the trigger guard. The rail makes it easy to attach a variety of tactical accessories, including lighting systems and laser aiming devices. Also, the 92A1 has a removable front sight, meaning that you can exchange it in a matter of minutes without any gunsmithing or alteration to the pistol. Maintenance is easy thanks to the tool-free disassembly latch as well as the captive recoil-spring unit. Another feature that will impress you about the 92A1 is the type of magazine it comes with. This pistol comes with three 17-round magazines designed to deliver remarkable firepower out of the box while being absolutely durable and corrosion resistant. Furthermore, the magazines on the 92A1 feature a “dirt rail” along their length, which helps collect dust and grit out of the magazine while keeping cartridges clear of the magazine walls. The result: enhanced feeding reliability and super-easy magazine maintenance. 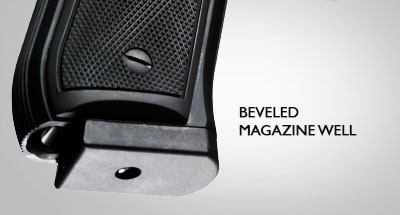 In addition, the magazine well is aggressively beveled, making it super-fast to change magazines without taking your eyes off the target. The base design of the 92A1 is the 92FS or M9, the pistol that has served the US military admirably throughout its campaigns in the world’s toughest environments. But even in this respect, Beretta never rests on its laurels. 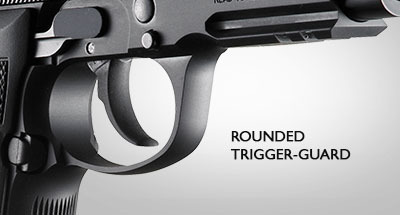 This pistol incorporates an innovative internal frame buffer that greatly reduces component stress under firing (yes, even with hot +P ammo), making it even more durable and smooth-shooting. The best of both worlds, the 92A1 offers discriminating shooters the classic overall look and feel of the 92 (including the more traditional rounded trigger-guard) with today’s most advanced tactical features.